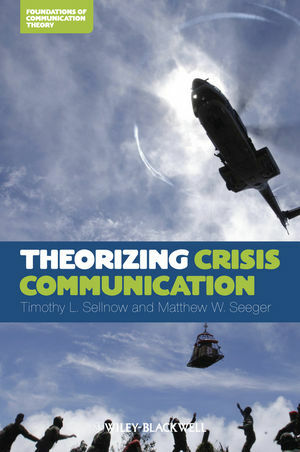 Theorizing Crisis Communication presents a comprehensive review and critique of the broad range of theoretical frameworks designed to explain the role of communication in the development, management, and consequences of natural and man-made crises. Brings together the variety of theoretical approaches emerging in the study of crisis communication into one volume for the first time. Timothy L. Sellnow is Professor of Communication and Associate Dean for Graduate Studies in Communication at the University of Kentucky. Dr. Sellnow’s interdisciplinary research on risk and crisis communication appears in an array of refereed journals, handbooks, and edited volumes. He has also co-authored five books on risk and crisis communication. Dr. Sellnow frequently serves as a consultant for Fortune 500 companies in the food industry and government agencies such as the United States Department of Agriculture (USDA) and Department of Homeland Security (DHS) on risk and crisis communication planning. Matthew W. Seeger is Dean of the College of Fine, Performing and Communication Arts and a Professor of Communication at Wayne State University in Detroit. His work on crisis, risk and communication has appeared in over 100 journal articles, book chapters, and conference proceedings. Seeger is the author or co-author of six books on organizational communication ethics and crisis and risk communication. Dr. Seeger also frequently serves as an advisor to the auto industry, manufacturing organizations and government agencies, including the Centers for Disease Control and Prevention (CDC), on topics related to crisis management.